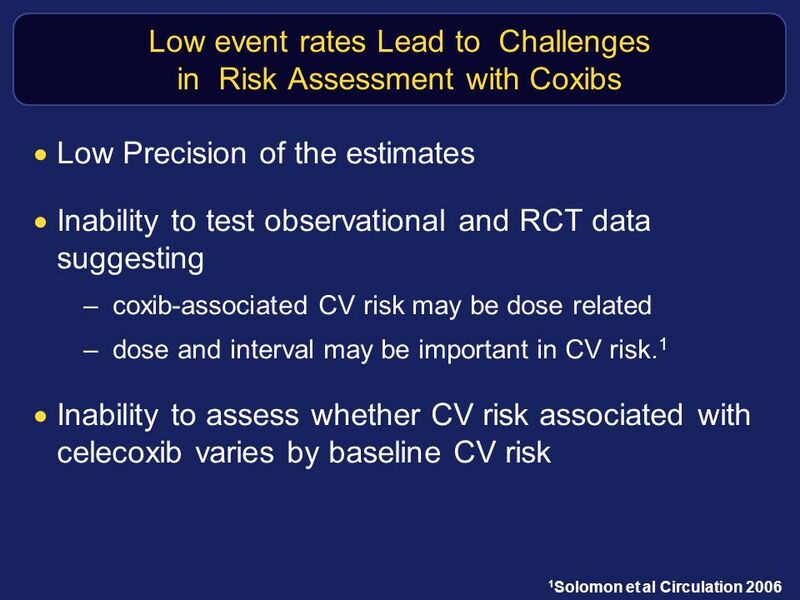 Cardiovascular Risk of Celecoxib in 6 Randomized Placebo-controlled Trials: The Cross Trial Safety Analysis Scott D. Solomon, MD, Janet Wittes, PhD, Ernest. 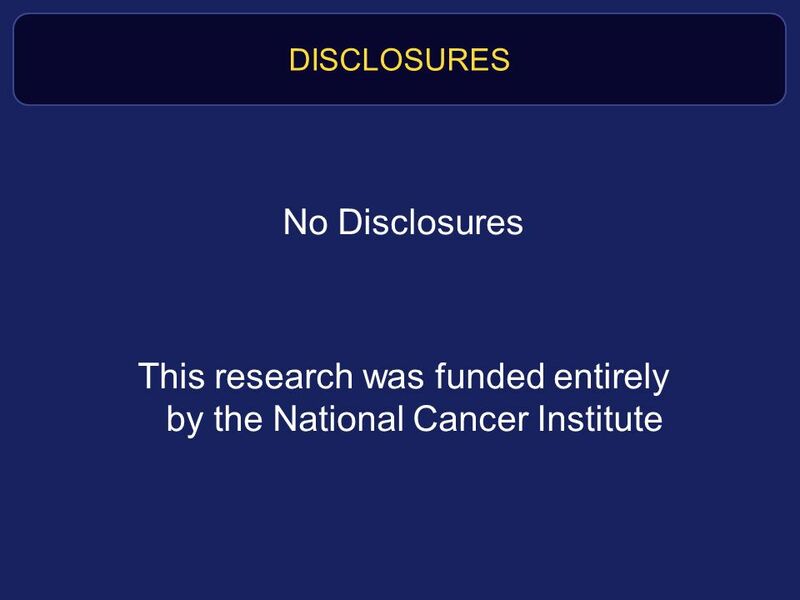 DISCLOSURES No Disclosures This research was funded entirely by the National Cancer Institute I have no conflicts of interest to disclose. This analysis was funded entirely by the National Cancer Institute. 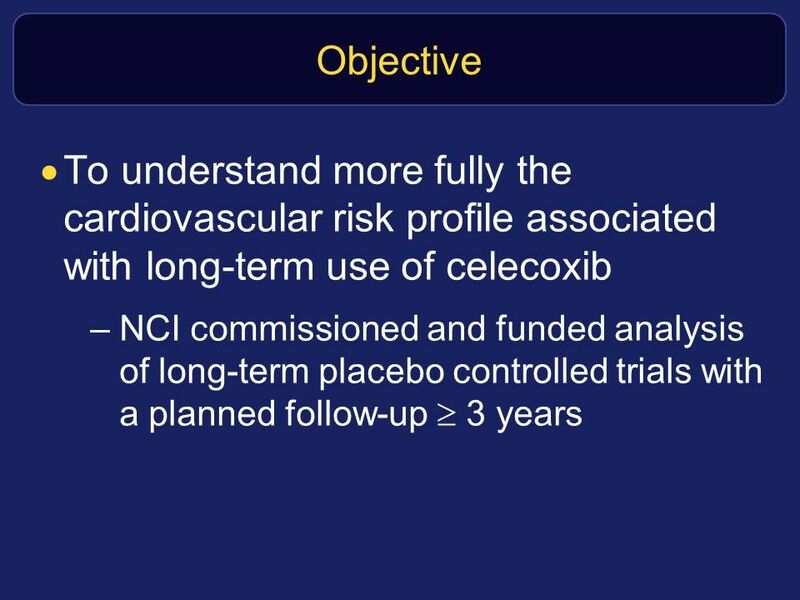 6 Objective To understand more fully the cardiovascular risk profile associated with long-term use of celecoxib NCI commissioned and funded analysis of long-term placebo controlled trials with a planned follow-up  3 years To understand more fully the cardiovascular risk profile associated with long-term use of celecoxib, the National Cancer Institute asked investigators in four long-term, placebo-controlled trials with a planned follow-up of 3 years or greater to submit their data for central adjudication and combined analysis by the same process used to analyze the APC and PreSAP studies. 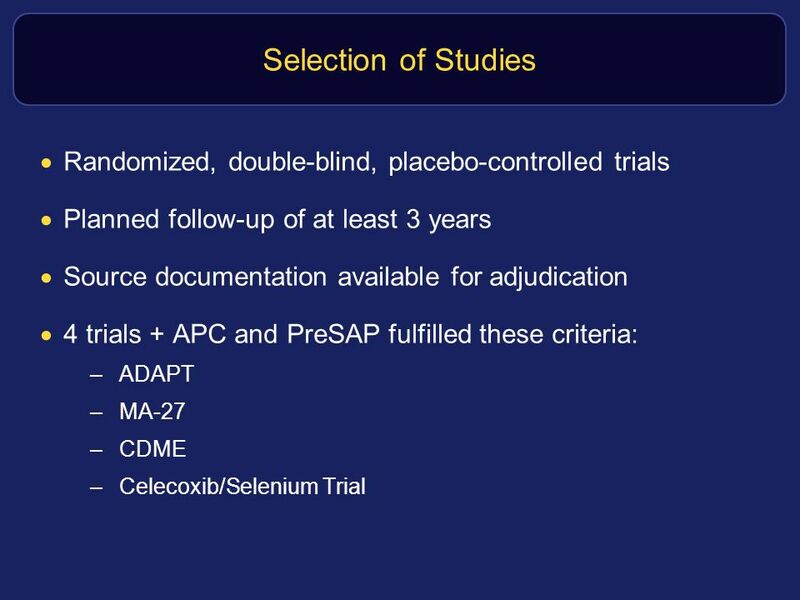 7 Selection of Studies Randomized, double-blind, placebo-controlled trials Planned follow-up of at least 3 years Source documentation available for adjudication 4 trials + APC and PreSAP fulfilled these criteria: ADAPT MA-27 CDME Celecoxib/Selenium Trial Prior to collecting data we specified that trials included in the analysis would have the following characterisitics: (1) they would be randomized, double blind, and placebo-controlled 2) the planned follow-up for each participant would be at least three years, and 3) source documentation would be available for central adjudication. 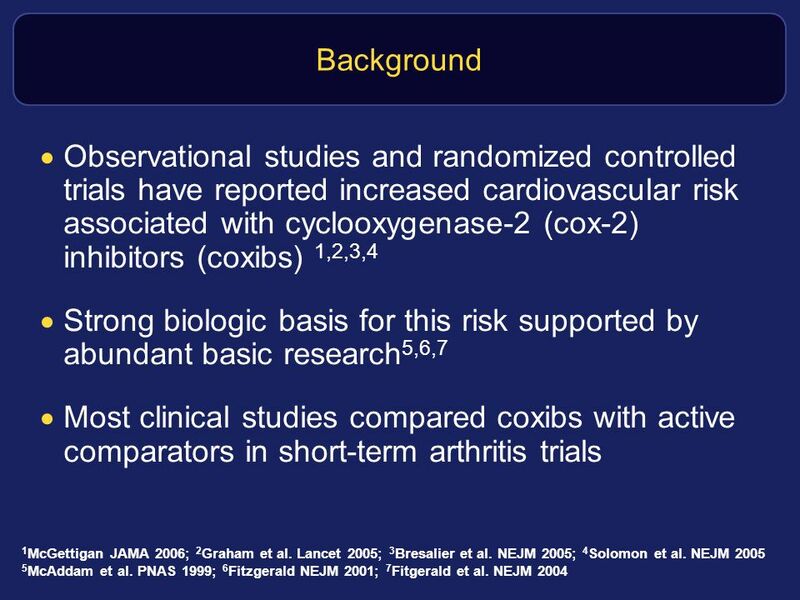 All trials fulfilling these two criteria studied the therapeutic potential of celecoxib for a condition other than arthritis. In addition to the APC and PreSAP trials that we had previously adjudicated and analyzed we identified 4 trials that fulfilled these criteria. Death (cardiovascular or non-cardiovascular) Myocardial Infarction Stroke Hospitalization for heart Failure Thromboembolic event Other cardiovascular Primary endpoint: CV death, MI, stroke, heart failure or thromboembolic event We adjudicated the following endpoints: Death, which was classified as cardiovascular or noncardiovascular, myocardial infarction, stroke, hosp for heart failure, thromboembolic event, and other cardiovascular. 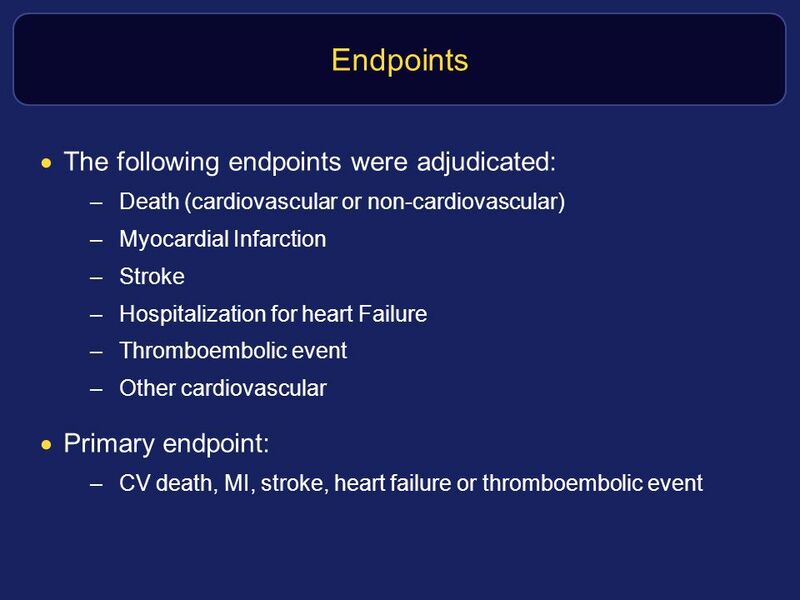 For the purposes of this analysis the primary endpoint was a composite of cardiovascular death, MI, stroke, Heart failure, or thromboembolic event. 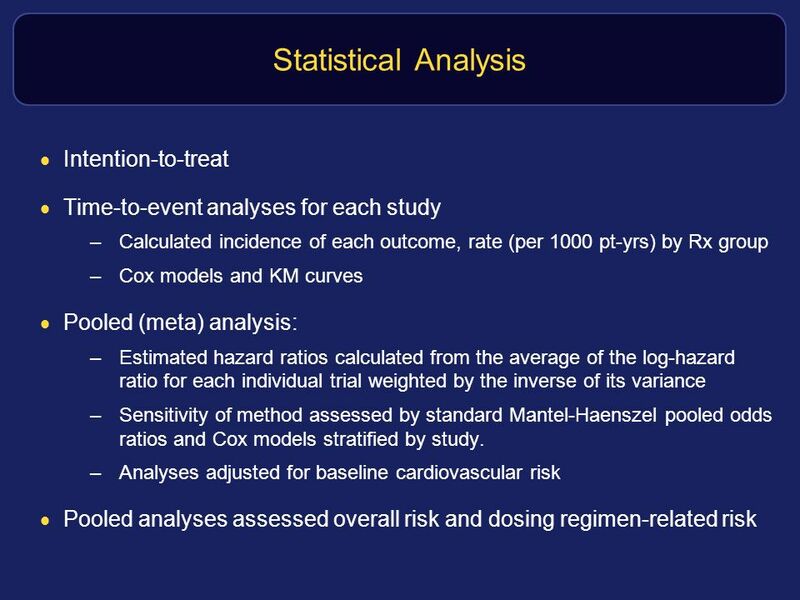 Time-to-event analyses for each study Calculated incidence of each outcome, rate (per 1000 pt-yrs) by Rx group Cox models and KM curves Pooled (meta) analysis: Estimated hazard ratios calculated from the average of the log-hazard ratio for each individual trial weighted by the inverse of its variance Sensitivity of method assessed by standard Mantel-Haenszel pooled odds ratios and Cox models stratified by study. 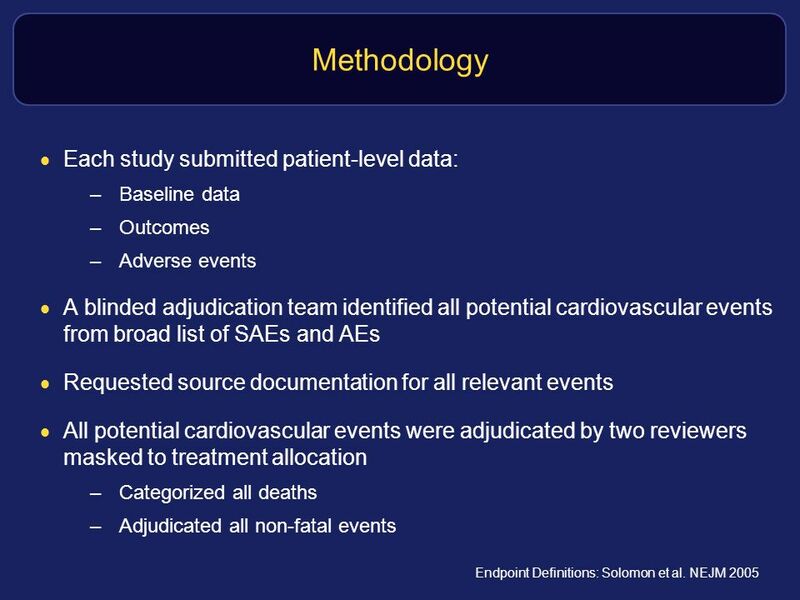 Analyses adjusted for baseline cardiovascular risk Pooled analyses assessed overall risk and dosing regimen-related risk We performed an intention to treat, time to event analysis for each study, and calculated the incidence of each outcome, and generate Cox models and Kaplan Meier curves. For the pooled analysis, we estimated hazard ratios calculated from the average of the log-hazard ratio for each individual trial weighted by the inverse of its variance, and the sensitivity of this method was assessed by both standard mantel-haenzel pooled odds ratios and Cox models stratified by study. 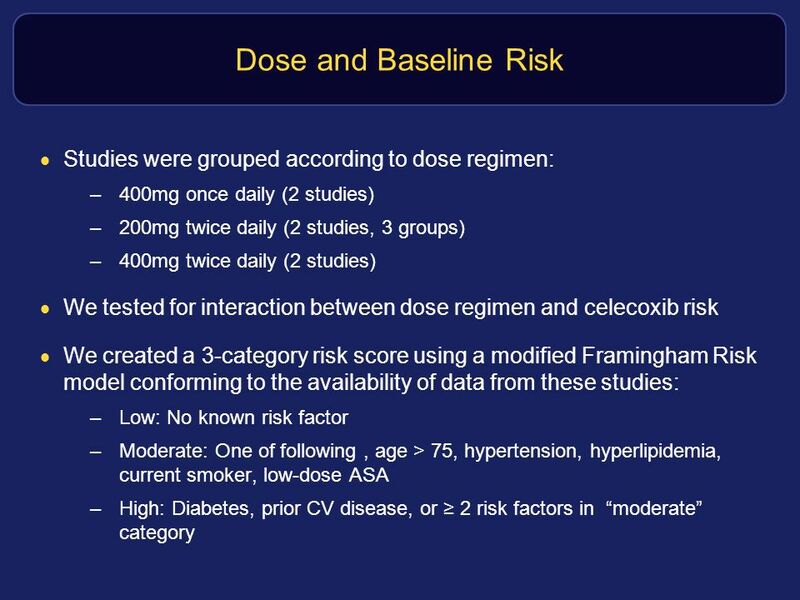 We adjusted our analyses for baseline cardiovascular risk, and assessed both overall and dose-regimen related risk. 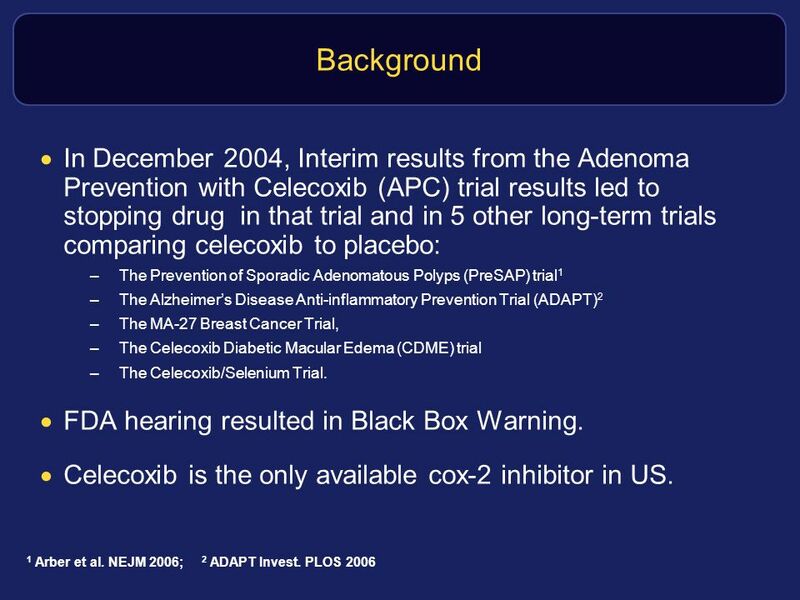 Study N Sponsor Disease being Studied Celecoxib Dose Planned follow-up time APC 2035 NCI and Pfizer Colorectal polyps Celecoxib 200mg BID, celecoxib 400mg BID, or placebo 3+ Years PreSAP 1561 Pfizer Colorectal Polyps Celecoxib 400mg QD or placebo MA27 1635 NCI, NCI Canada, & Pfizer Breast Cancer Recurrence celecoxib 400 mg BID or placebo ADAPT 1809 NIA Alzheimer’s disease and cognitive decline Celecoxib 200mg BID or Naproxen sodium 220 mg BID, or placebo Up to 7 years CDME 86 NEI Diabetic Retinopathy Celecoxib 200mg BID or placebo Cel/Sel 824 NCI Celecoxib 400 mg QD or placebo 3-5 Years The six trials studied are listed here and with the exception of the PreSAP trial were all sponsored or jointly sponsored by the National Institutes of Health. The number of patients enrolled in each trial ranged from 86 in the CDME trial to 2035 in the APC trial. 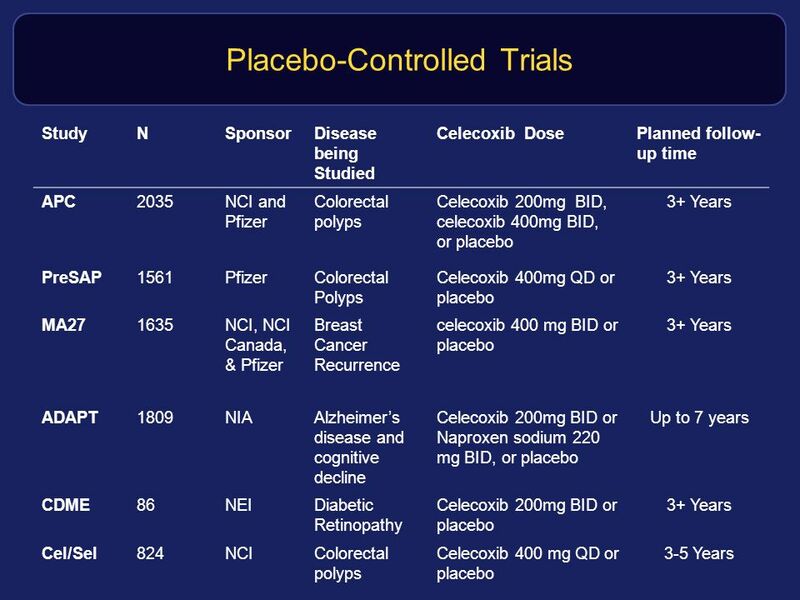 Each of the trials were designed to study the role of celecoxib for a condition other than arthritis, and these included prevention of colorectal adenoma recurrence, breast cancer recurrence, alzheimer’s disease, and diabetic retinopathy. The doses of celecoxib tested ranged from 400mg once daily in two studies, 200mg Twice Daily in 2 studies and 400 mg twice daily in two studies. Combined there were patient-years of follow-up. ADAPT APC CDME MA27 PreSAP Cel/Sel Total # enrolled Pt-Years 1809 3530 2035 6234 86 101 1635 695 1561 4141 824 1369 7950 16070 Age, mean (SD) 75 ± 4 59 ± 10 59 ± 9 64 ± 9 60 ± 10 63 ± 9 64 ± 10 Male 54 68 62 66 50 White race 97 92 67 94 89 96 93 Diabetes 7.4 9.5 100 6.1 10 7.5 9.2 HTN or med 40 41 34 37 36 38 Hyperlipidemia or med 33 55 17 28 Current smoker 3 ? 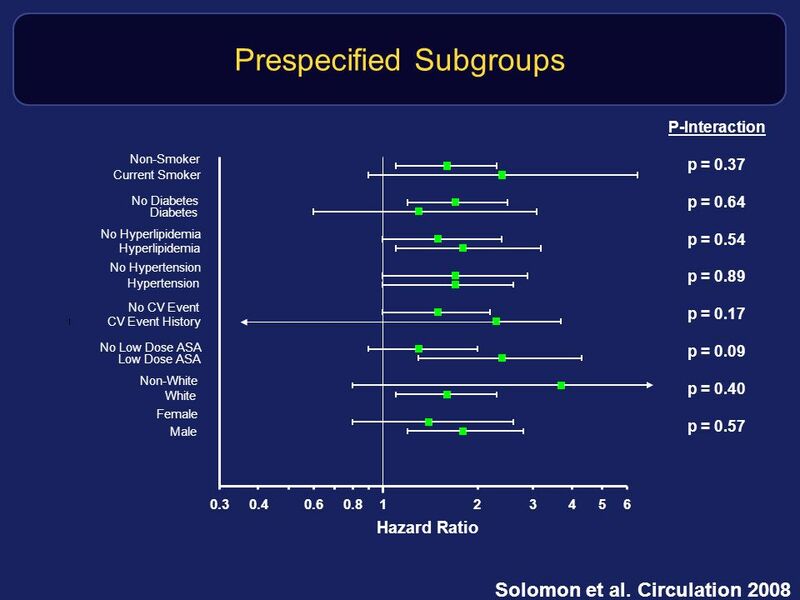 24 16 14 Low-dose ASA use 31 45 Prior CV event 13 1.2 7 12 Low CV risk 32 19 Moderate CV risk 26 29 23 27 High CV risk 59 47 51 Baseline characteristics are shown here. 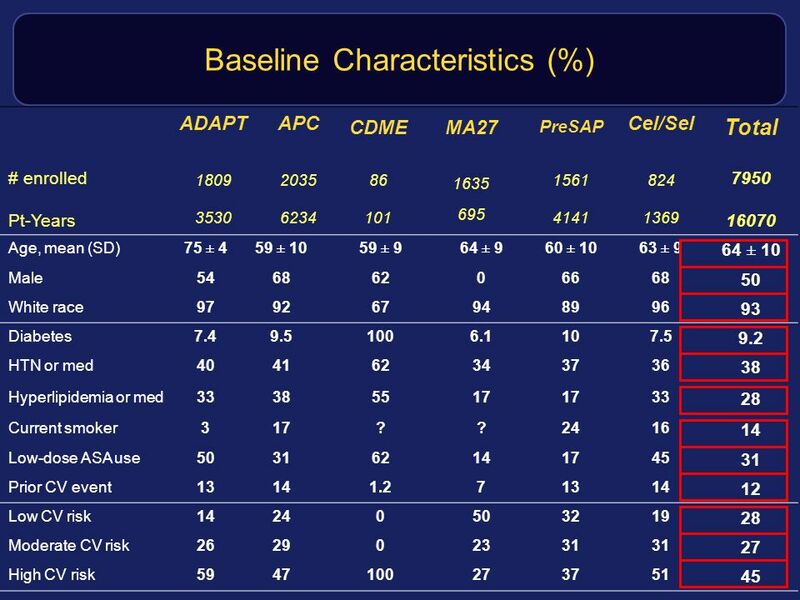 Overall the mean age was 64, and ranged from 59 in the APC and CDME trials to 75 in the ADAPT study. Approximately half of the overall patients were male, the majority were caucasian. 9% of patients were diabetic; of note all of the patients in the retinopathy study were diabetic. 38% were hypertensive or on hypertensive medications; 28% were hyperlipidemic or on lipid lowering drugs;14% were current smokers. 31% were low-dose aspirin users. 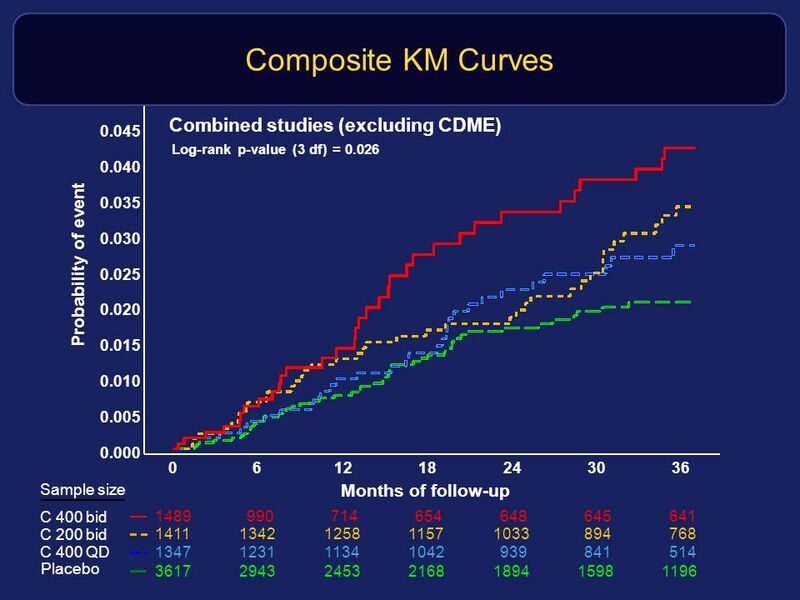 Based on our modified risk score, we categorized 28% of patients as low-risk, 27% as moderate risk, and 45% as high risk for CV events. There was some heterogeneity between the trials – most importantly, the ADAPT patients were older, by design, and the retinopathy study patients were all diabetic, also by design. None of the trials included in this analysis was designed or powered with the intent of assessing cardiovascular risk. Doses tested higher than those typically used in osteoarthritis patients. recommended doses in rheumatoid arthritis, acute pain and dysmenorrhea, FAP. These data provide the strongest evidence of a dose-related risk Data do not address the cardiovascular risk of doses lower than those tested. Some limitations and caveats of this analysis should be noted. None of the trials included in this analysis was designed or powered with the intent of assessing cardiovascular risk. 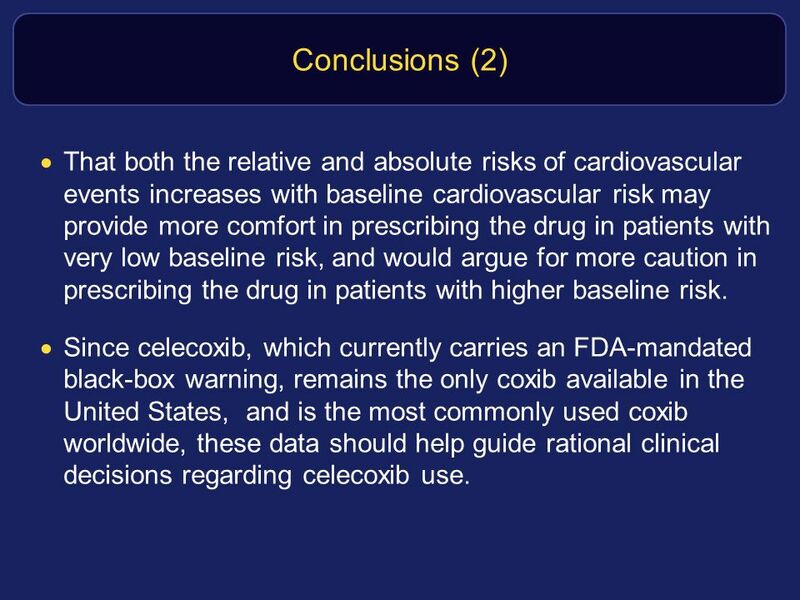 As a result, we used data collected for other purposes to assess the effect of celecoxib on cardiovascular outcomes. The increased risk observed in this analysis needs to be considered in light of the high doses of celecoxib tested. All the tested doses are higher than the doses of celecoxib typically used in osteoarthritis patients (recommended daily dose 200mg); however, our data are directly relevant to doses recommended in the current celecoxib prescribing guidelines for patients with rheumatoid arthritis, acute pain and dysmennorhea, familial adenomatous polyposis, as well as doses currently being tested for non-arthritic conditions. 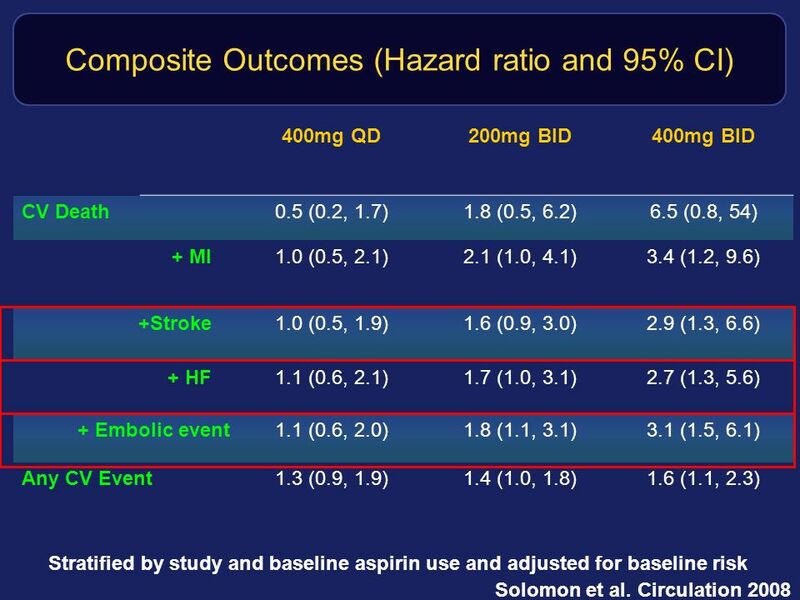 Moreover, these data provide strong evidence of a dose and dose-regimen related risk. 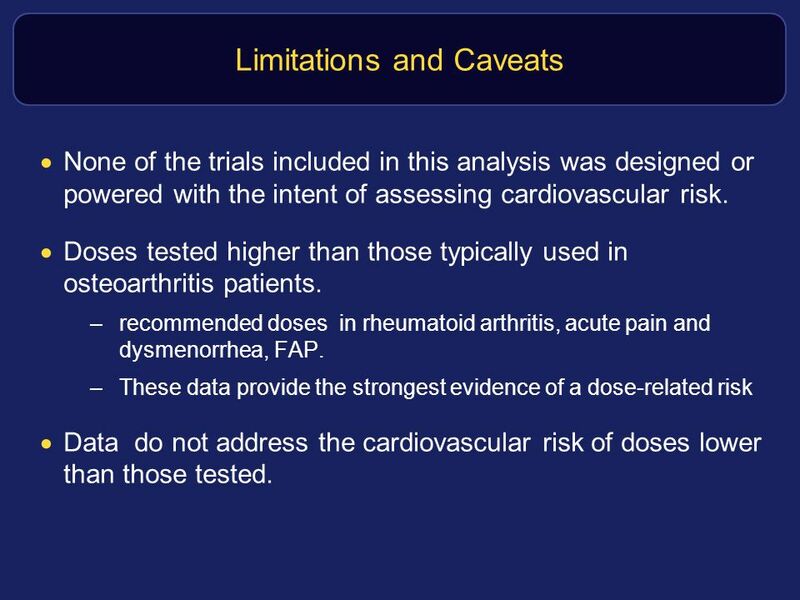 Our data do not, however, address whether doses lower than those tested in any of these trials would lead to lower cardiovascular risk, or whether non-selective non-steroidal anti-inflammatory agents would be associated with similar risk. We must therefore be cautious in extrapolating these results to doses not tested. 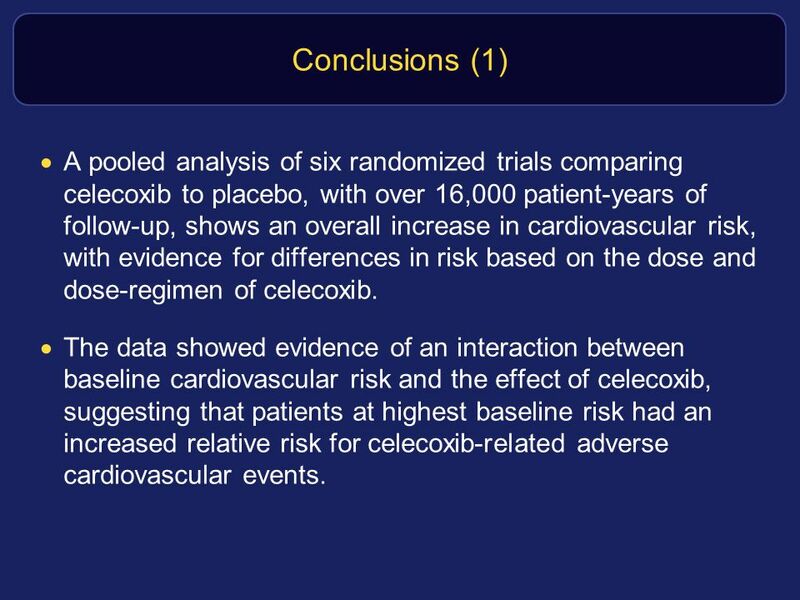 20 Conclusions (1) A pooled analysis of six randomized trials comparing celecoxib to placebo, with over 16,000 patient-years of follow-up, shows an overall increase in cardiovascular risk, with evidence for differences in risk based on the dose and dose-regimen of celecoxib. 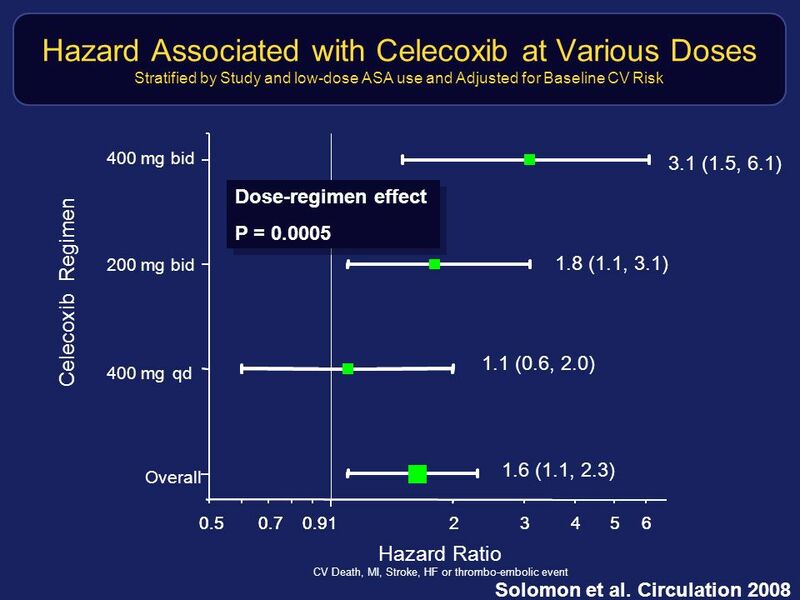 The data showed evidence of an interaction between baseline cardiovascular risk and the effect of celecoxib, suggesting that patients at highest baseline risk had an increased relative risk for celecoxib-related adverse cardiovascular events. 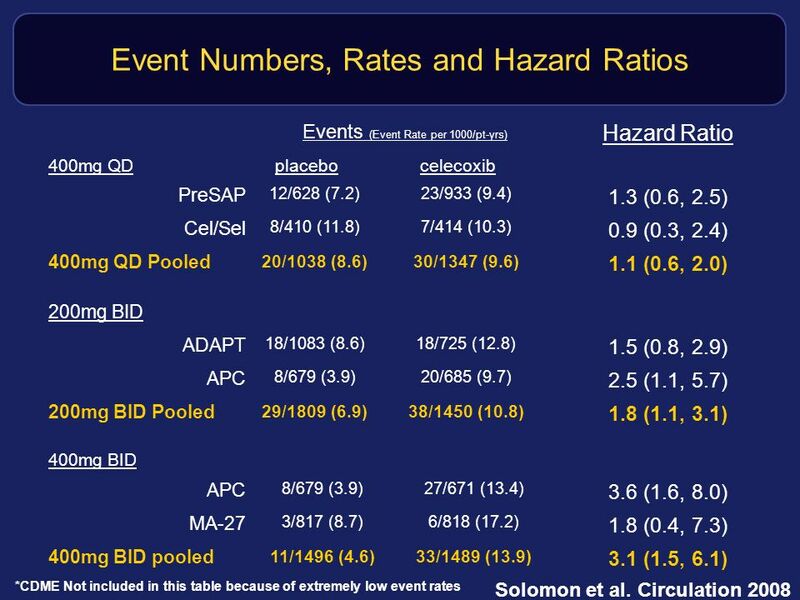 In conclusion, A pooled analysis of six randomized trials comparing celecoxib to placebo, with over 16,000 patient-years of follow-up, shows an overall increase in cardiovascular risk, with evidence for differences in risk based on the dose and dose-regimen of celecoxib. 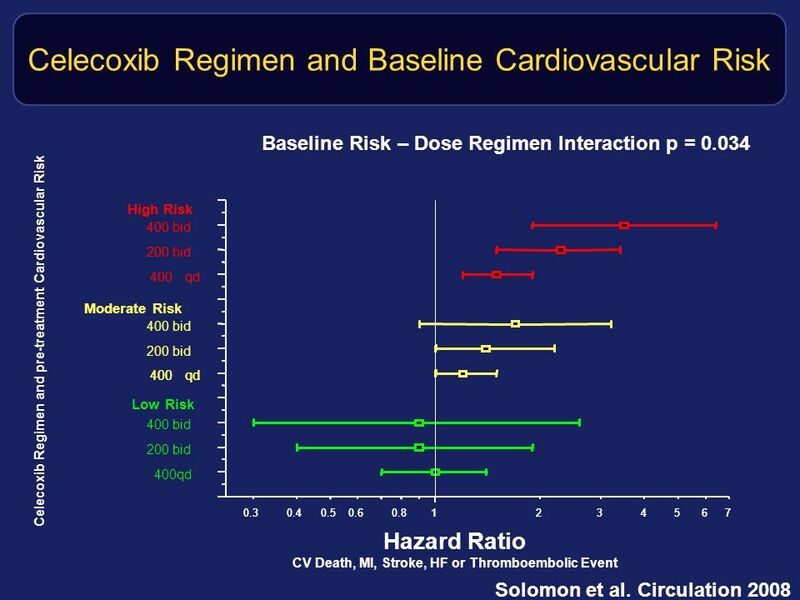 The data showed evidence of an interaction between baseline cardiovascular risk and the effect of celecoxib, suggesting that patients at highest baseline risk had an increased relative – and not just absolute - risk for celecoxib-related adverse cardiovascular events. 21 Conclusions (2) That both the relative and absolute risks of cardiovascular events increases with baseline cardiovascular risk may provide more comfort in prescribing the drug in patients with very low baseline risk, and would argue for more caution in prescribing the drug in patients with higher baseline risk. Since celecoxib, which currently carries an FDA-mandated black-box warning, remains the only coxib available in the United States, and is the most commonly used coxib worldwide, these data should help guide rational clinical decisions regarding celecoxib use. That both the relative and absolute risks of cardiovascular events increases with baseline cardiovascular risk have important clinical implications; these data may provide a measure of comfort in prescribing celecoxib in patients with very low baseline risk, but would argue for caution in prescribing celecoxib in patients with higher baseline risk. Since celecoxib, which currently carries an FDA-mandated black-box warning, remains the only coxib available in the United States, and is the most commonly used coxib worldwide, these data should help guide rational clinical decisions regarding celecoxib use. 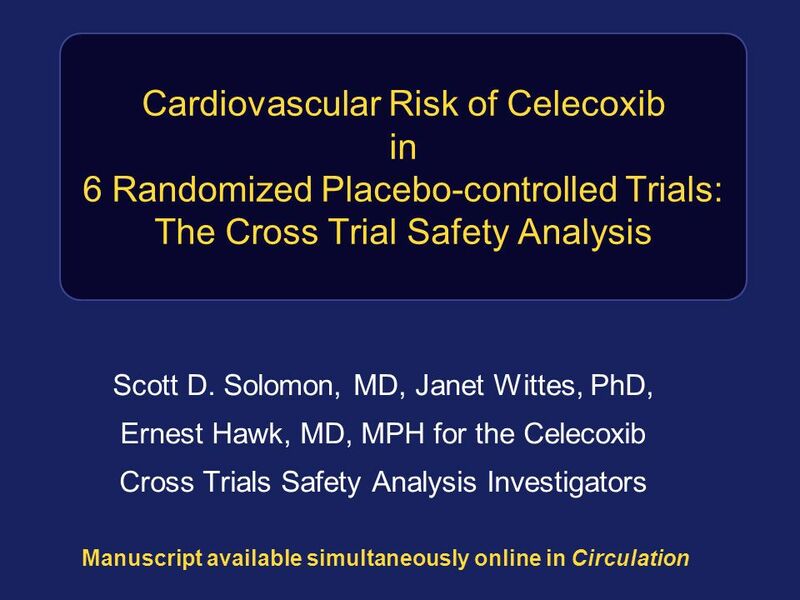 Download ppt "Cardiovascular Risk of Celecoxib in 6 Randomized Placebo-controlled Trials: The Cross Trial Safety Analysis Scott D. Solomon, MD, Janet Wittes, PhD, Ernest." US cost-effectiveness of simvastatin in 20,536 people at different levels of vascular disease risk: randomised placebo-controlled trial UK Medical Research. Efficacy and Safety of Exercise Training as a Treatment Modality in Patients With Chronic Heart Failure: Results of A Randomized Controlled Trial Investigating. Carol Coupland Paula Dhiman Tony Arthur Richard Morriss Julia Hippisley-Cox University of Nottingham Garry Barton University of East Anglia Antidepressant. Women’s Health Initiative - Summary of results DISCLAIMER Menopausetoday gives the following presentation for your information and.